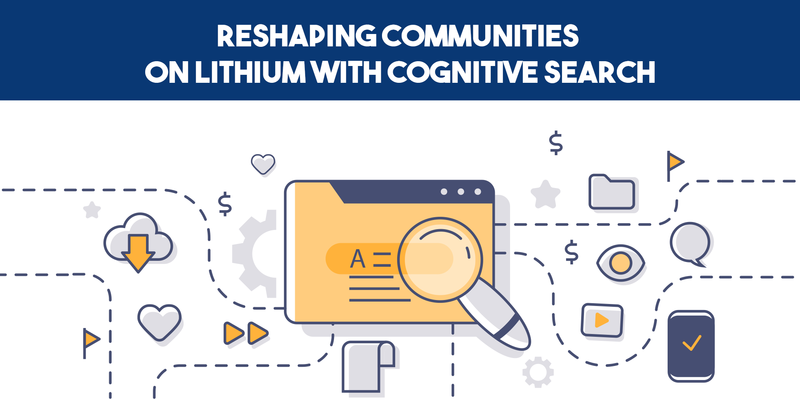 Online communities on Lithium play a crucial role in fostering long-term relationship between a brand and its customers. They enable easy access to answers and give users the ability to share their experiences. This improves knowledge sharing and gives customers an opportunity to resolve minor queries themselves. This is why a number of large and medium-sized organizations invest in a Lithium community. Well, what if we tell you there is a way to stir things up on your community and take it up by several notches? The answer is by tapping on cognitive technology. Lack of Unified Knowledge Architecture: To begin with, the organization was belting out a lot of content to ease customers. However, the content was spread across multiple sources including a community, help center, support portal, etc. Due to lack of a unified knowledge architecture on the online community, the firm was unable to make the most out of the existing information sets. When SearchUnify joined their existing fleet of technologies, the first thing it did was integrate all knowledge channels. This created a single gateway that scanned and delivered right answers to the user without the need for them to hop between silos. It not only helped in improving employee productivity but also scale customer satisfaction by turning the community into a case-deflecting ninja. Need for More Able Search Functionality: People use search to find answers. Thanks to the search powerhouse Google, they now expect all the relevant answers on their screen at the click of a button. However, the default search was not able to cope up with the ever-increasing size of content repositories. As a result, it would often prioritize information on the basis of keyword density or historical significance. Fortunately, AI, machine learning, and NLP, the part and parcel of SearchUnify’s algorithm, worked in coalition to deliver personalized and germane results to users. NLP helps understand users’ search intent, then machine learning analyzes their recent activity to personalize results, and finally AI compares the search query with results that worked in the past to deliver valuable information. This further enabled the organization to drive KCS as well as maximize its content’s reach and effectiveness. Control Results that Reach End-users: With an unprecedented expansion of product list along with their frequent version updates, the size of the subsequent repository kept on increasing. As a result, relevance took quite a beating and search queries would often populate outdated pieces in top results. To prevent that from dampening the user experience, the customer wanted search results to be restricted to newer pieces. Thankfully, the combined forces of AI & machine learning worked tirelessly to ensure no redundant information made it to final results. In case that was not enough, the organization could always take the matter in its own hands and manually set search preferences. To put it simply, automatic and manual optimization segregated useful pieces from the rest. Identify What Works Best and Foster Engagement: The heart and soul of every Lithium-powered community lies in engagement. However, building an engaging community is no child’s play. And without engagement, it fails to deflect cases and reduce support cost. To put it blatantly, it might not add any significant value to the customer and justify the ROI. To tackle this issue, a number of features came into play such as faceted search, role-based recommendations, smart suggestions, and so on. They aided delivery of relevant results in real-time and led to a manifold boost in engagement. Additionally, the organization could analyze gaps in content and evaluate content usability. All of this led to a higher customer satisfaction rates and reduced the number of lodged cases. 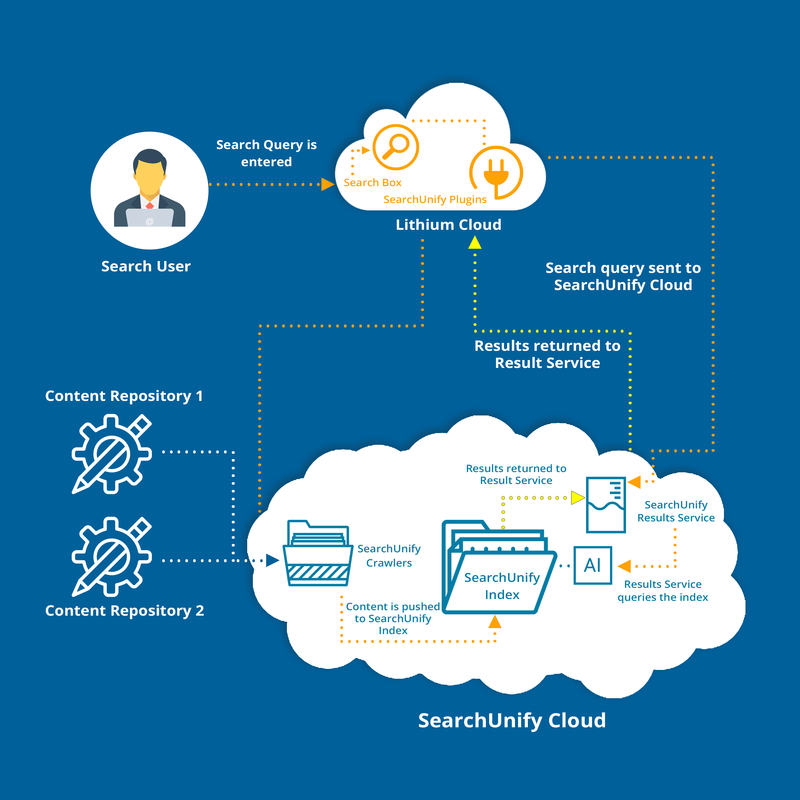 Once a query is entered, it is picked up by SearchUnify’s endpoint and forwarded to SearchUnify Cloud where it is processed and matched with a fitting answer. After it enters the SearchUnify Cloud, the Results Service kicks in and scours the index. This is where the AI frenzy actually begins pitching the query against closest results. Crawlers ingest structured and unstructured data from the added repositories and push the ideal pieces into the index to be picked up by Results Service. The finalized pieces are then taken up by Results Service where they are displayed to the search user. The customer was able to exponentially upscale its community on Lithium. With a little cognitive push, the organization was not only able to magnify community engagement but also augment the ability to pinpoint more relevant answers. Talking about results, the firm witnessed a massive 75% spike in searches with relevant results. Additionally, 60% of the total conversions were attributed to content pulled in from other sources. Furthermore, there was a 30% and 40% surge in monthly visits and number of monthly searches respectively. Impressive, isn’t it? Want to get a piece of the action? Then request for a live demo and see the epitome of enterprise success unfold right in front of you.